Gracious as always, Yankees general manager Brian Cashman spent about 10 minutes with a large group of media members in the Yankee Club at Waterfront Park following the player development contract press conference. You could have put your Double-A affiliate anywhere…what made you initially align with the Thunder in 2003, and what made you want to stick around for as long as it seems like you guys are going to? How did you arrive at extending this through 2022 as opposed to a shorter term? With Tony Franklin being named Eastern League Manager of the Year, that must mean a lot to you guys as an organizaton as well…can you just talk a little bit about him finally winning that award here? Is he at the point in his career where he sort of dictates whether he comes back next season? What specifically does he offer young players? Do you anticipate any big league rehabs coming here soon, such as A-Rod? Is Gardner a possibility as a pinch runner? At this point of the year, it’s an interesting time with September call-ups…how do you determine which players you call up now and which ones you wait for until their seasons are done? There’s obviously a lot of players on this Thunder roster who have stood out all season here…but who are the guys who have stood out to you or the organization that are here? It seems like Dellin Betances has regressed this season…is it safe to say that he’s a guy that you would have hoped would have helped you at the big league level this year? How do you guys view him in the future in terms of starting or relieving? Has anybody in this organization who was under the radar kind of come out of nowhere to make a mark in the system this year? Mike Ashmore: As an organization, how do you determine which guys you send to the Arizona Fall League? Newman: “Several factors. First is who needs at-bats, and who is in a physical and mental condition at the end of the year where they can gain from another 50 games out there. That’s the major consideration. We typically want to find players with upside that can make a step in their progress toward the big leagues in that 50-game pod or whatever you want to call it. Those are the criteria. MA: I know the pitchers haven’t been announced yet, but what kind of names are you throwing around as far as guys who might be heading out there? MA: Is it typically guys who haven’t had a lot of innings that you’ll send out there? MA: With Betances, was there anything serious on the MRI? JN: How much do you guys work with him on the between the ears side of the game? Newman: “We’ve worked with him and everybody else. We talk about three aspects of the athlete all the time. Physical; bigger, stronger, faster…Fundamental; catch it, throw it, slide, hit…and mental and emotional. Understanding the game from a strategical and tactical standpoint and then feel the right away about yourself and how you fit in this game at various times. We deal with that with everybody and he’s no different. JN: Is that last aspect — whether that’s his problem or not — is that the hardest to treat? Newman: “The hardest thing to treat is no ability. I can’t tell you the number of kids I’ve seen over my lifetime in this business that have improved mentally and emotionally and gotten confidence and gained an understanding of the tactical side of the game. Addy has made great improvement, and there’s no reason Dellin can’t do that. Dellin’s had moments where he’s looked like a big leaguer and moments where he was less than that. JN: You said he’s a major league pitcher, do you still see him as a major league starter? MA: Pardon my ignorance on the eligibility rules aspect of it, but is Dellin someone you could and/or would send to the AFL? JN: How do you guys value minor league playoffs as far as development is concerned? Does it help them to be in a postseason environment? 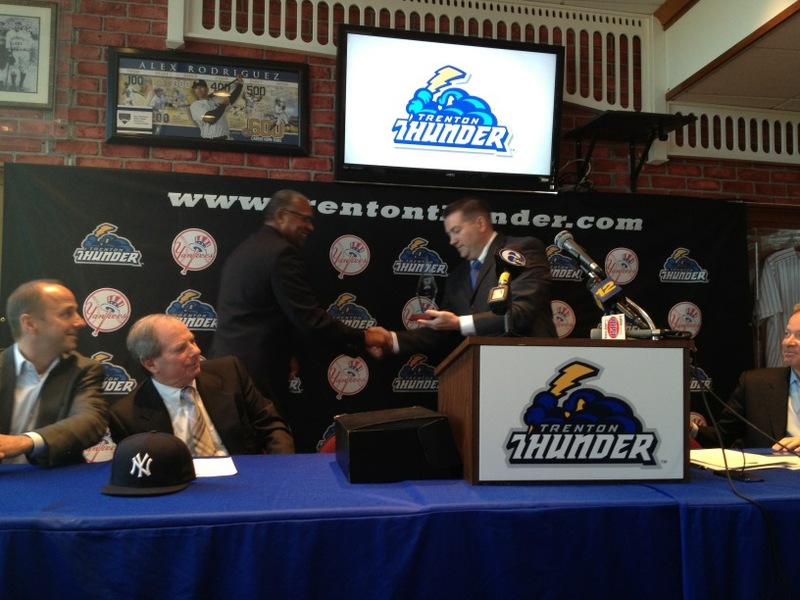 At the press conference in which the Thunder and Yankees extended their player development contract, Tony Franklin was named the 2012 Eastern League Manager of the Year. In his sixth season with the club, the extraordinarily popular 62-year-old skipper has led his team to a 77-60 record, good for first place in the Eastern Division. He’s also won two championships, and led Trenton to four playoff appearances in six seasons, but had never before won the award. In true Franklin fashion, he deflected the attention from himself, instead choosing to acknowledge his coaching staff and players when handed the honor. “I humbly accept this. This is a really, really, really nice honor,” he said. “But awards like these don’t happen by me being out there, there are a lot of people that go into helping guys receive these awards…my coaching staff; pitching coach Tommy Phelps, coach of everything Luis Dorante and our hitting coach extraordinare, we’ve hit like crazy, Tommy Slater. They’re all tireless workers, very experienced and passionate about what they do. They’re one of the biggest reasons why I can stand up here and accept all these accolades. Yankees general manager Brian Cashman, who was present for the news conference, joined a long list of those raving about the efforts of Franklin, who is 99 games over .500 as Thunder manager (482-383). “Tony’s an ace,” Cashman said. 6:05 PM — Josh Norris and I spoke to Mark Newman for about ten minutes…stay tuned for a joint release on that most likely tomorrow. — The confidence is back. And so too is a postseason berth for the Trenton Thunder, their ninth playoff appearance in 19 seasons of existence and sixth in ten years as a Yankees affiliate. Today’s game — a 7-4 win over a fading New Britain club — was essentially the opposite of yesterday’s tough loss. This time it was Trenton that got ahead early, putting up six runs on Rock Cats starter Steve Hirschfeld in the first two innings. The Thunder hit three home runs in those first two innings; one each from David Adams, Addison Maruszak and Adonis Garcia. Garcia would add another longball later on. Vidal Nuno cruised through six innings of one-run ball, and although there were some hiccups after he came out from Graham Stoneburner and rehabbing big leaguer Pedro Feliciano, Ryan Pope came in to record the final five outs and seal the win. There was no ridiculous celebration — typical of a Tony Franklin team — but there were a few players dancing in the clubhouse…quite poorly, I might add. “I told them we’ll celebrate like no other when we win what we’ve come here from the start of the season to win,” Franklin said. The swagger seems to be back. “There was that two-week stretch where we were pretty down on ourselves, but we battled back,” said David Adams. “We put together a couple wins, and then after losing the first one yesterday, I think it only got us a little more hungry. I think we’re building that excitement back up and that confidence back up, and I’m excited to see what we can do. There is, of course, a fine line between confidence and cockyness. To be clear, Addison Maruszak spoke confidently after the game about his team’s chances once the playoff start on September 5th. “We’re pretty confident that we can win it,” he said. — For Adams, he finally got to experience the feeling of clinching a playoff berth in a Thunder uniform. Adams was on the 2010 team that went to the championship series…except he never got that far, not even close. He missed the majority of the last year and a half due to an ankle injury, but now that he’s back and healthy, he’s glad that he’s getting the opportunity to advance to the postseason in the capital city. Watching a team he should have been on advance to the playoffs two seasons ago, Adams says, wasn’t easy. — Maruszak exited the game in the fourth inning after fouling a ball off his calf, but expects to be able to play tomorrow if needed. “I’ve faced that guy before, and he’s never thrown cutters like that,” said Maruszak of the odd occurence of fouling a ball off his calf. — Walter Ibarra is still “under the weather,” according to Tony Franklin, and that’s why he couldn’t come in the game tonight and the defense had to shift around the way it did…Ibarra has not played since August 22, but is not on the disabled list. 6:10 PM — Spoke to Brett Marshall for something you’ll see a little way down the road…he’s your likely Game 1 starter once the playoffs begin. 2:20 PM — Uh, well. It’s 2:20. So there’s not a whole hell of a lot going on here. Stump Merrill is supervising J.R. Murphy and Jeff Farnham on throwing drills from behind the plate. That do anything for you? Yeah, I thought so. I’ll have lineups and whatnot for you as the day unfolds here in lovely Trenton. — Let’s start from the beginning. That was not one of Craig Heyer’s best outings tonight. Making a spot start, the affable righty lasted just 2 1/3 innings, allowing six runs in a nightmare first frame. He gave up seven runs in all, and has allowed 29 earned runs in 28 innings since coming off the disabled list (right arm soreness) on June 30. “Arm-wise, I feel good. Mechanically, I don’t,” Heyer said after the game. Thunder manager Tony Franklin isn’t concerned about Heyer just yet, but acknowledges that he needs to be better. When offered this as an excuse, Heyer didn’t take it. — Luke French, on the other hand, was outstanding. The former big leaguer threw a nine inning complete game against Trenton, which is something you next to never see in the Eastern League. 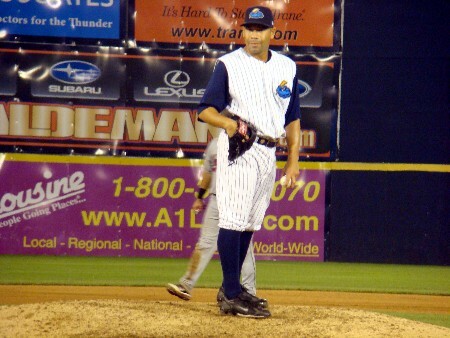 The hulking lefty allowed only a Kevin Mahoney fifth inning home run to break up his shutout, and befuddled the Thunder lineup all night. Just two years removed from the big leagues, he knows an outing like this was a big step towards a possible return there. “I pitched pretty good down here, but didn’t have the same success in Triple-A,” French said. — Oh yeah, a major leaguer rehabbed with Trenton today. Pedro Feliciano faced four hitters — three of them lefties — and struck out two while walking one in a scoreless sixth. He’s still expected to throw one inning tomorrow and another on Thursday before finally getting back to the big leagues for the first time since 2010. Feliciano told me that he was pulling his head back a little too much, and opened himself up a bit, leading to a little bit of erratic command. Ticket Website HQ offers great deals on MLB baseball tickets such as New York Yankees tickets, Texas Rangers tickets, Boston Red Sox tickets and also Philadelphia Phillies tickets. Find great sports tickets, concert tickets (such as Taylor Swift tickets) and theater tickets online at Front Row King. MLB baseball tickets, NFL football tickets, NBA basketball tickets, UFC tickets and WWE tickets are available now on Front Row King. Your best bet for New York Yankees Tickets , Colorado Rockies Tickets and San Francisco Giants Tickets is Alliance Tickets. 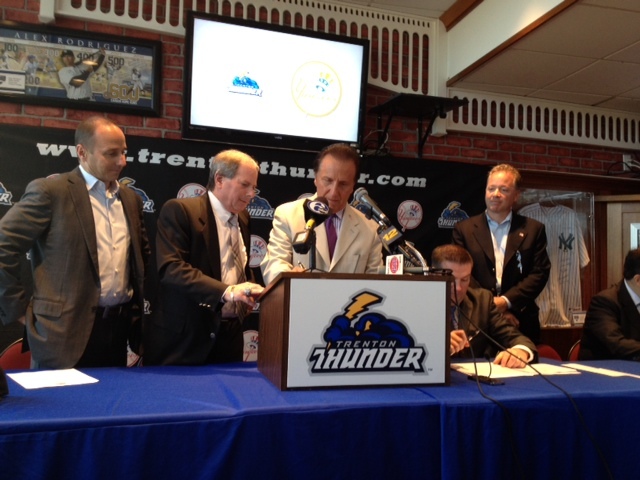 Thunder Thoughts is in no way associated with the Trenton Thunder, Eastern League, New York Yankees, or its employees or players. All information is subject to change. All views and comments made from outside parties, other than Thunder Thoughts personnel, are subject to their own permission. They are not the views of Thunder Thoughts or any of the aforementioned parties. If you have any questions regarding this policy, or for more information, please contact Thunder Thoughts.